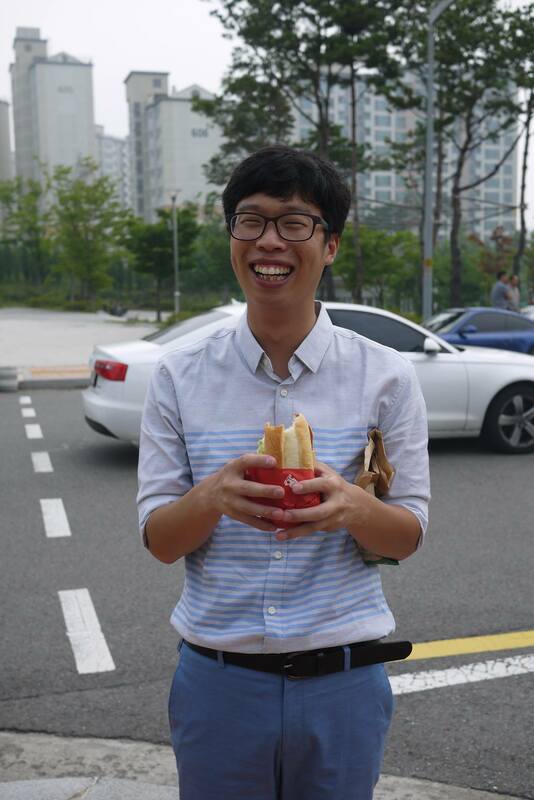 Sang-Min Lee enjoying his first hamburger after being released. Photo courtesy of Kyong-Jung Kim. Last year we shared the story of Sang-Min Lee, a Mennonite conscientious objector sentenced to 18 months in prison. The global church and others who resonated with Sang-Min’s peace witness responded by writing him letters and praying for him. Over the course of a letter-writing campaign supported by Bearing Witness, Justapaz, and Mennonite World Conference, 48 people from nine different countries committed to writing letters to Sang-Min over the course of his imprisonment. Last week the prayers of many were answered as Sang-Min was released from prison on July 30, three months early! Sang-Min’s service in the prison’s barber shop was credited to his 18-month prison term, allowing him to leave earlier than his sentence dictated. I’m thinking a lot of all the people I’m thankful for. My support group’s care, people that took care of me well, people who gave me news through letters, people who came the long way to see me in the midst of busy schedules, people who supported me regularly. On top of that, the people who thought of me and prayed for me…As I live, I’m not sure how I can repay this huge light you’ve brought to me. Truthfully, my time in prison began in the summer of 2007 when I first began to think seriously about conscientious objection. That time of worrying and deciding was so hard, that the moment I was imprisoned was almost a relief. Of course, I can’t tell that long story here. Anyway, by chance I came to the Southern Correctional Facility, and somehow I’ve been cutting hair for a little over a year now. It’s a relief that I got something out of going. But when it’s all said and done, prison is a “Prison of People.” Time in prison has its ups and downs, and like looking in a mirror, it is to many people a time to reflect on themselves. It’s a precious experience where much is received and many things are realized. In the wake of Sang-Min’s release, Kyong-Jung Kim, Northeast Asia Representative for Mennonite World Conference, requests continued prayer for the 660 conscientious objectors who are jailed each year in Korea and for the Korean churches’ non-violent peace witness. Sang-Min’s case was also an example of the possibilities of international collaboration around the issue of conscientious objection. Bearing Witness initiated the letter-writing campaign, Mennonite World Conference frequently sent out prayer requests to the global church during Sang-Min’s trial, and Justapaz connected Sang-Min with conscientious objectors in Colombia who also face hardships for their stance against military service. Many others shared Sang-Min’s story in their churches or prayed for him in their daily prayers. Sang-Min faces a new set of challenges as he reenters civilian life, as those who supported him are now challenged to continue strengthening the bonds and connections that grew out of concern for Sang-Min during his imprisonment. May we face that challenge with courage and wholeheartedness. Now that Sang-Min has access to email again, those wishing to follow-up with him are invited to email him at semz87(at)gmail(dot)com.